If you have tooth sensitivity, eating and drinking can be a cause of anxiety. If water is too cold, you’re in pain. If your oatmeal is too hot, you’re in pain. It feels like your teeth just can’t handle consuming anytime sometimes. If you have tooth sensitivity, you aren’t alone. It is estimated that 60 percent of Americans have sensitive teeth. Tooth sensitivity happens when the dentin and enamel of the teeth wear away, exposing the nerves. This causes pain, discomfort, and a throbbing sensation. If you have this problem, there is hope. 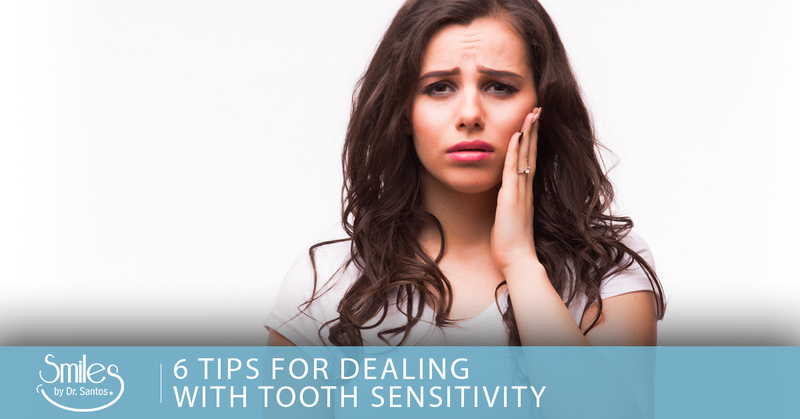 There are steps you can take to reduce your tooth sensitivity and to prevent your teeth from becoming more sensitive. You want to be sure that your toothpaste and mouthwash are supporting your sensitive teeth. Invest in a toothpaste designed for sensitive teeth, which usually contains potassium nitrate and strontium chloride to reduce sensation in the dentin nerves. If it works, you can continue to use it on an ongoing basis. In addition, when choosing a mouthwash, look for one that contains high levels of fluoride. Fluoride has shown to strengthen tooth enamel. In addition, it prevents the bacteria that causes teeth decay from adhering to your teeth, facilitating more efficient brushing. Speaking of brushing, make sure that you’re brushing in such a way that doesn’t aggravate your tooth sensitivity. First, make sure you are using a soft-bristle toothbrush, as using a hard-bristle toothbrush has shown to wear away at enamel and recede gums, which causes sensitivity. While many foods and beverages contain acid, if you have sensitive teeth, you should make an effort to reduce your exposure to certain foods. For example, carbonated beverages, citrus fruits, wine, yogurt, and salad dressing are all highly acidic and should be consumed in moderation. Another tip is to use a straw when you are drinking acidic liquids. Also, rinse your mouth with either water or milk after consuming acidic foods or drink. While professional teeth whitening should not cause enamel damage, be wary of any at-home whitening strategies. Any that contain hydrogen peroxide are likely to cause damage to your teeth. Before you make any teeth-whitening attempts, talk to your dentist in Manahawkin for advice. We can offer you professional teeth whitening, or recommend some natural remedies that will not harm your enamel. At our dental clinic in Manahawkin, we work with many individuals who struggle with sensitive teeth. We can develop a treatment plan that helps reduce tooth sensitivity and makes it easier for you to manage the pain. If you’re interested in learning more about our services, including laser dentistry, give us a call today.